The Eastwood store had been opened since December last year, and I am one of the many witnesses of how long the queue can get ever since its first day of opening. During the first days of January, we would even see people lined up as early as 6:00 in the morning to get their dozens of donuts. It was like having a mad sale of donuts everyday! Click Read More.. during the event, we got to make our own J.Co Donuts! I got to know more about J. Co Donuts during the official opening event. My research told me it first came from Singapore, but I found out it was founded by Mr. Johnny Andrean, who came all the way from Jakarta, Indonesia (aah.. Indonesia.. this country is very special to me!). Mr. Adnrean express his gratitude for supporting the J.Co Donuts and Coffee. He also said he is happy to see pictures of J.Co Donuts with longs lines; and thanked media practitioners for writing good things about J.Co Donuts (well, really, it is not hard to write for something that is just soo good!). To address the demands of J.Co - holics, the Eastwood store will now operate 24/7, and more stores will open and expand even in the cities of Vizayas and Mindanao. 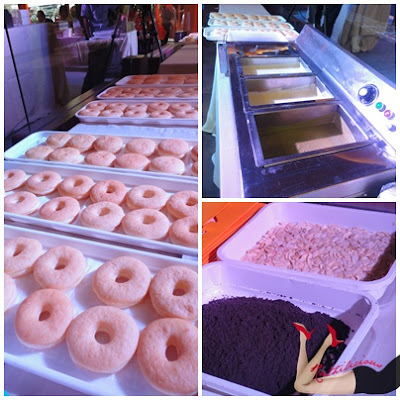 During the event, guests were treated with more J.Co Donuts, coffee and frozen yogurt. But the biggest story was the announcement that we can experience making our own J.Co Donuts! The ingredients are all ready, and we played bakers.. I am proud of my Green Tease! It is not easy creating that spider-web! We also need to pair our donuts with the coffee drink. The best pairing will win a pass from J.Co Donuts - which means, he/she will get a dozen the whole year, every month! My bloggie friend, John of Kumagcow won! Wow! I loove that J.Co Donuts allowed us to be a baker and barista for a day! my dexterity to put drizzle around the cup and to put a whipped cream! Cafe Avocado is just soo good! I didn't win anything, but it was a fun afternoon. I have learned a lot from J.Co Donuts (like, they let their donuts/chocolate ganache to settle first for 20 long minutes before putting garnishings - esp in preparing Alcapones). This company is serious about quality. Thumbs up. My mom and (even) my dad agreed that J.Co Donuts got good selections (and witty donut names!). My mom is addicted to Alcapones! As for me, my new favorite is the Crema La Fame! I just hope that their staff would continuously wear the smile they showed us during the event to each and every J.Co customers. It is nice for a business to have repeat customers not just because of the products - but because of the good service too! (and I really miss working in a coffee shop and seeing our regular guests who became our friends too!). What is your favorite from J.Co Donuts? Thank you to J.Co Donuts and Bridges PR for the invite to this exclusive event!